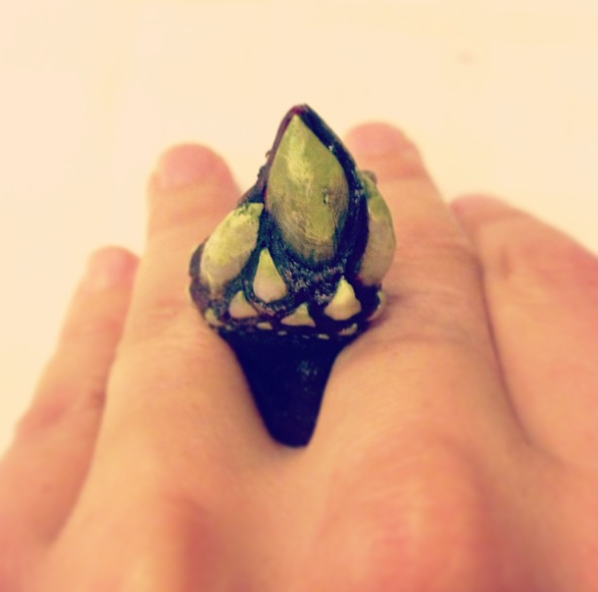 I was recently served a calamari ring so large, it resembled a halo in a fishy nativity play. It came straight off a “tapas” menu, along with three other equally confused dishes. Is there no end to this pseudo Spanish fuckery, I grumbled through cumin-laced burps. 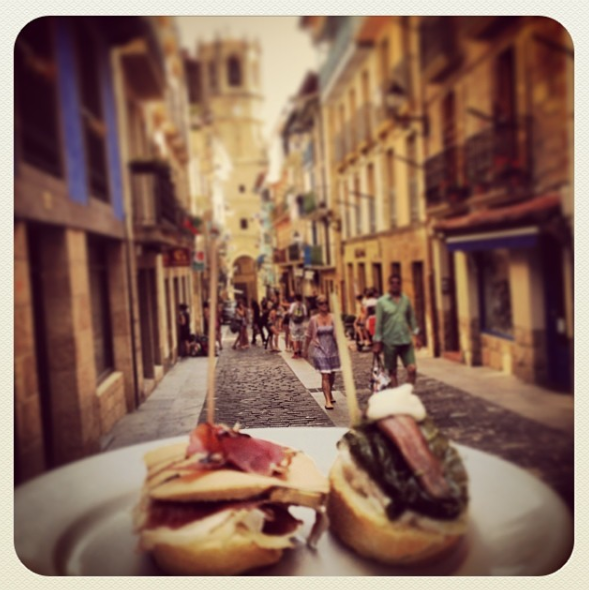 I’m not going to tell you what tapas should be because even in Spain, tapas is a diverse offering. 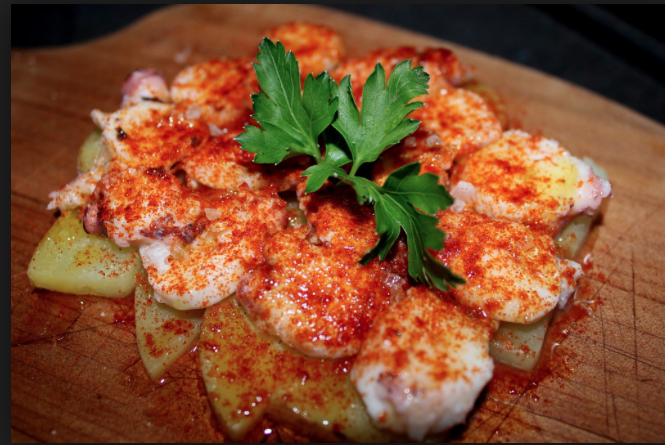 There are, however, certain traditions and classic dishes that could inspire a lovely tapas menu. I guess what I’m saying is, if you’re going to do tapas, why not draw inspiration from the country that’s been doing it for several hundred years? 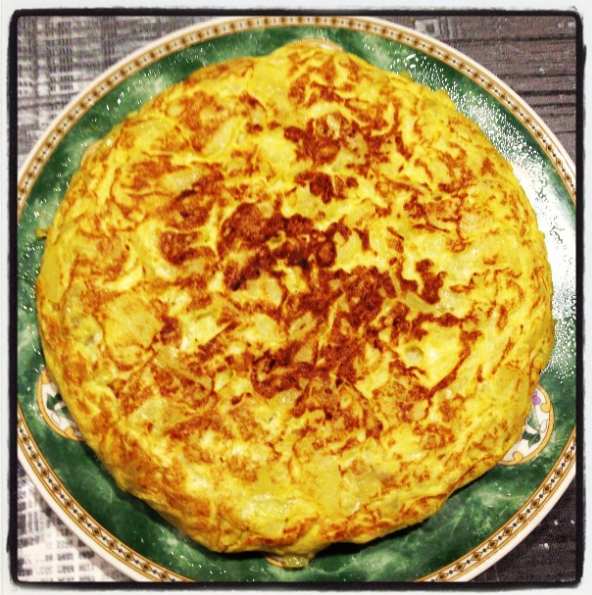 Tortilla – The best mid-morning snack with coffee, or late afternoon tummy liner with a sip of beer. Finely sliced onion and potato fried until soft, blended into whisked eggs and returned to the pan. There’s a trick to making tortilla as it involves several flips until you have a nicely rounded pie that is moist at the centre without falling apart. The variations are endless, with green pepper or ham and cheese being favourites. Croquetas – A thick béchamel sauce shaped into spheres, dipped in egg and breadcrumbs and fried. Done well, they are a delicious lifesaver on the drinks circuit. Ham, cheese, chicken and seafood croquetas are typical. 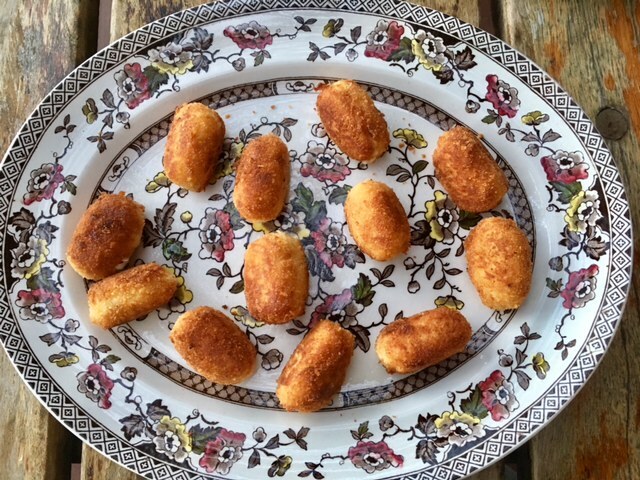 Unlike similar dishes served elsewhere in Europe, Spanish croquetas do not contain mashed potato. Try this recipe. 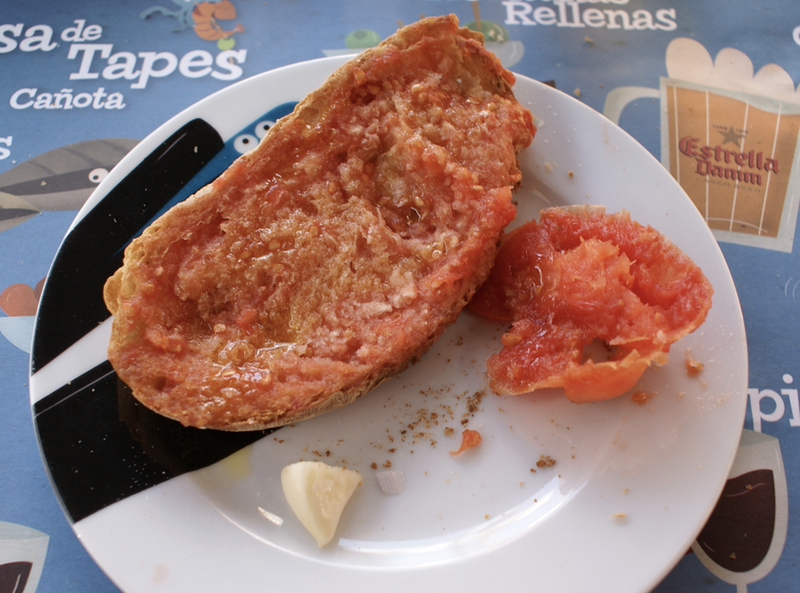 Pan con tomate or Pa amb tomàquet – I loved this Catalan classic so much, I dedicated a blog post to it after arriving in Barcelona. Ideally made with toasted pan cristal – a light, airy bread – and small, overly ripe tomatoes with spotty skin that get smashed into the bread after a good rub of garlic and lashing of olive oil. Seasoned with salt. Done right, few things come close to it. 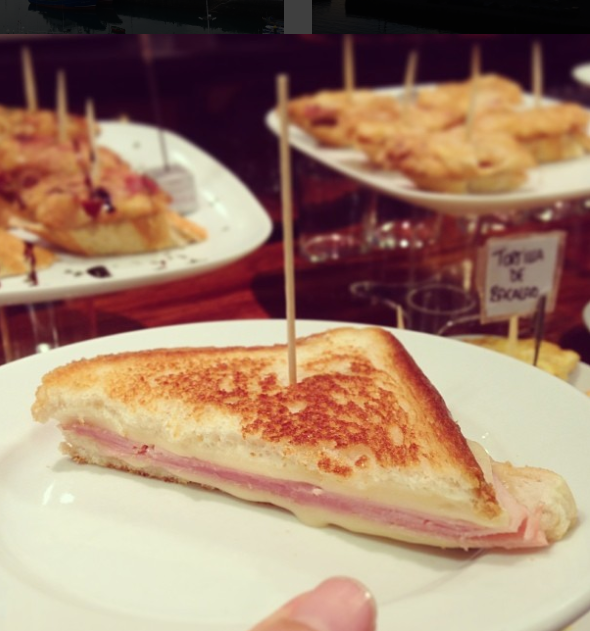 Topped with jamón ibérico, it is pure bliss. As served at Cañota de Tapas in Barcelona. Not the best example of pan cristal but still delicious. Superb pan con tomate at a deli in Getaria. Note the consistency of pan cristal. Topped with jamón ibérico. Padrón Peppers – Sadly not available in South Africa, padrón peppers are mild compared to chillis but after a plateful, the heat does seem to build. 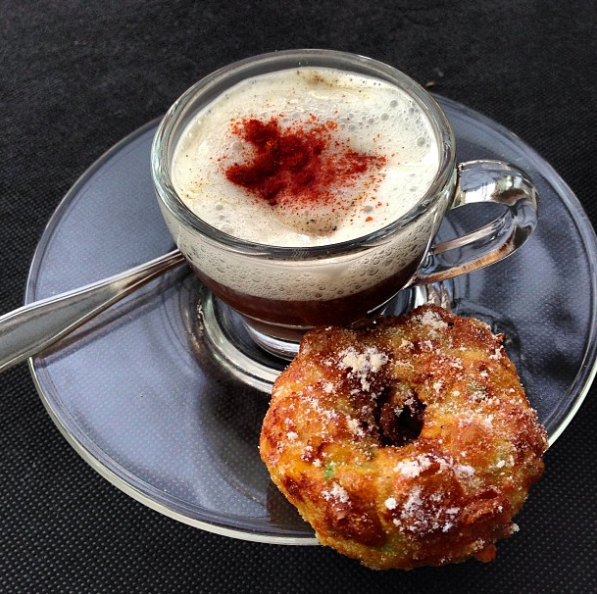 Plus, every once in a while, a confused padrón behaves like one of its hotter cousins. 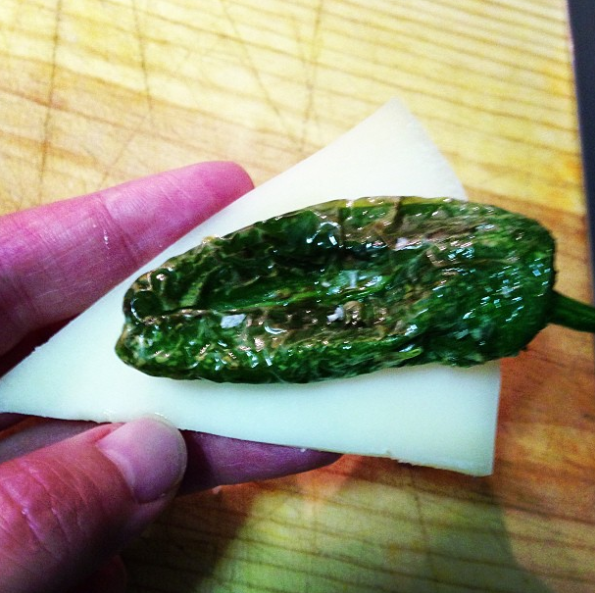 Blistered in very hot olive oil and served with flaky salt, it’s the embodiment of Spanish simplicity. Fried almonds are prepared in a similar fashion. 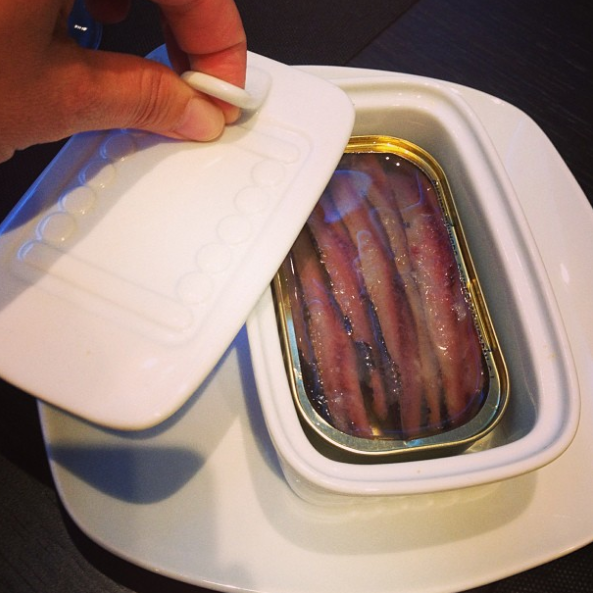 Anchovies – A tapas staple. 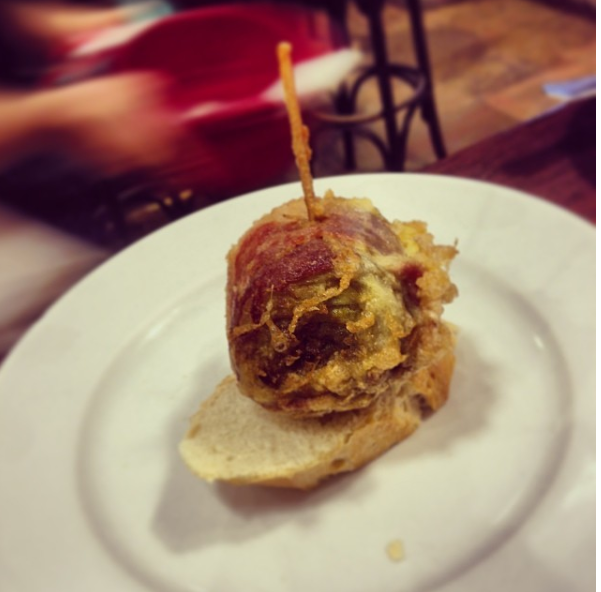 Draped over towering pintxos or served unadorned in all their salty splendour. 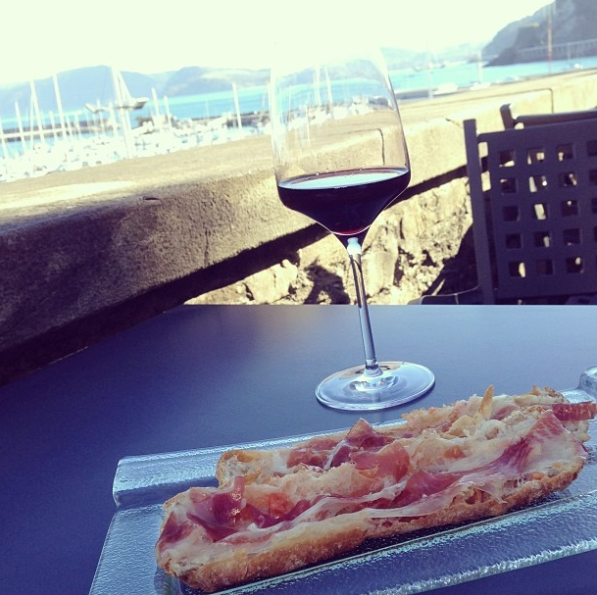 A favourite is toasted baguette with slivers of roasted red pepper in olive oil, topped with anchovy. Crisp bread, silky sweet peppers, pop of the sea to finish. Perfection. 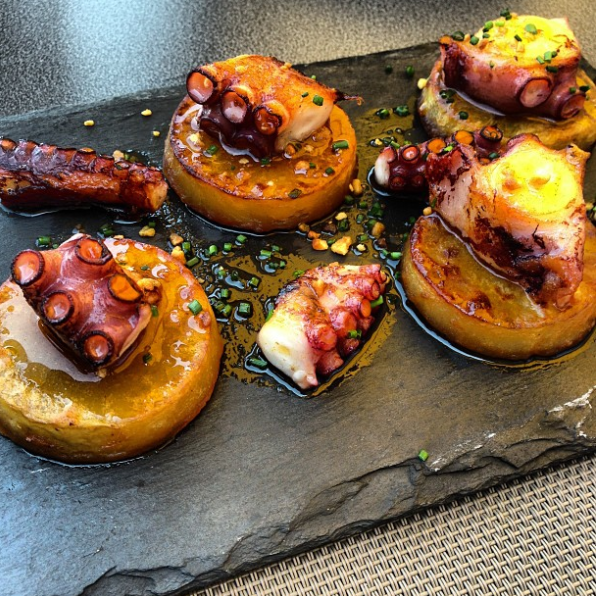 Octopus – Boiled, sliced and served with salt, oil and a sprinkling of sweet smoked paprika. Often served on a layer of sliced, boiled potato to soak up the delicious juices. Just that. 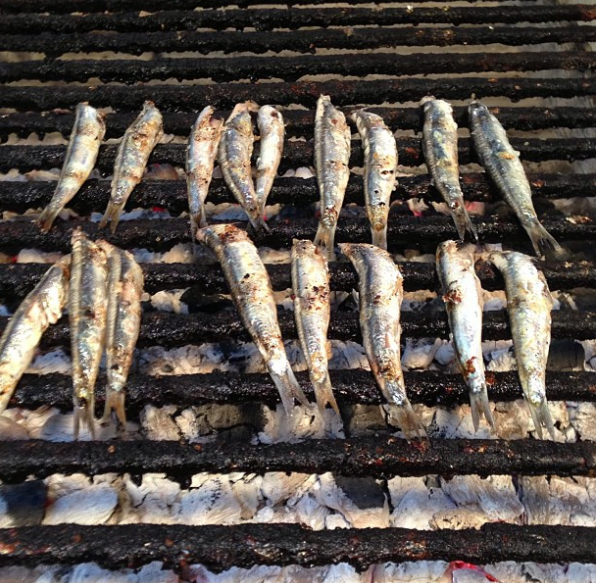 Grilled Sardines – Say no more. Patatas bravas – Chunks of deep-fried potato, served with Romesco sauce and/or aioli. Very simple, filling and a vegetarian. In most establishments, the Romesco sauce would be from a bottle. 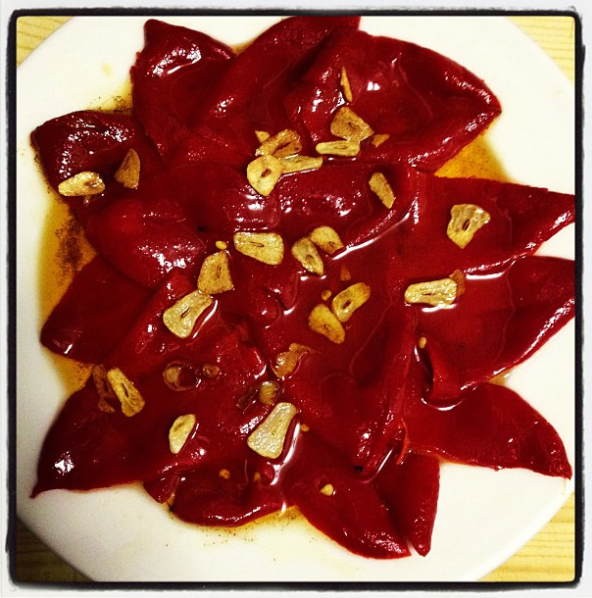 Sweet red peppers – My go-to tapa de casa (house tapa) – blistered and peeled red peppers, sliced and plated. Warm a glug of olive oil in a pan, add sliced garlic and heat through. Toss over the peppers and season with flaky salt. Served with sliced sheep’s cheese, cured sausage and jamon, you’re doing very well indeed. I was blessed to live in Getaria for a year, a small fishing village close to San Sebastian. 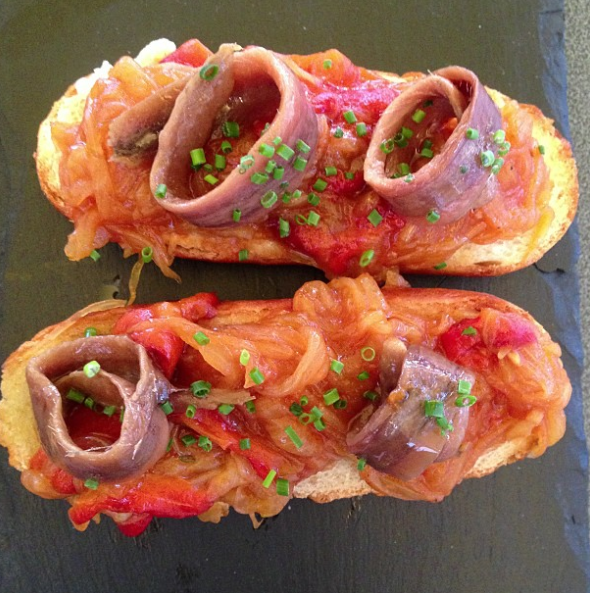 “Pintxos” is “tapas” in Euskera – the language of the Basques. 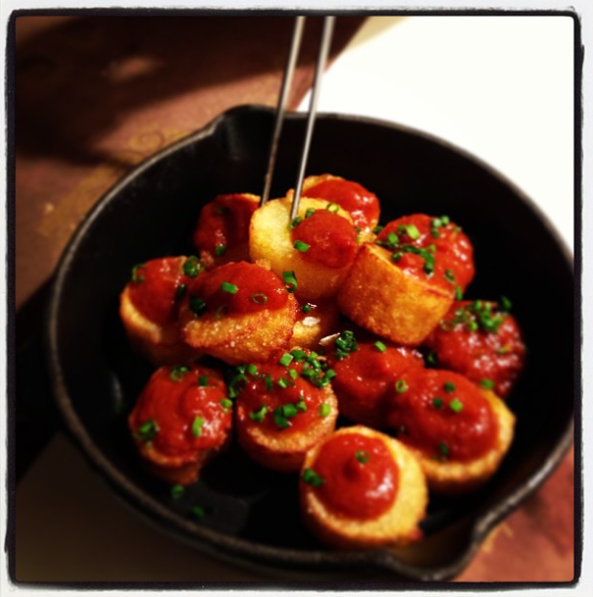 There is common ground between tapas and pintxos, as favourite dishes have migrated from one area to the next. 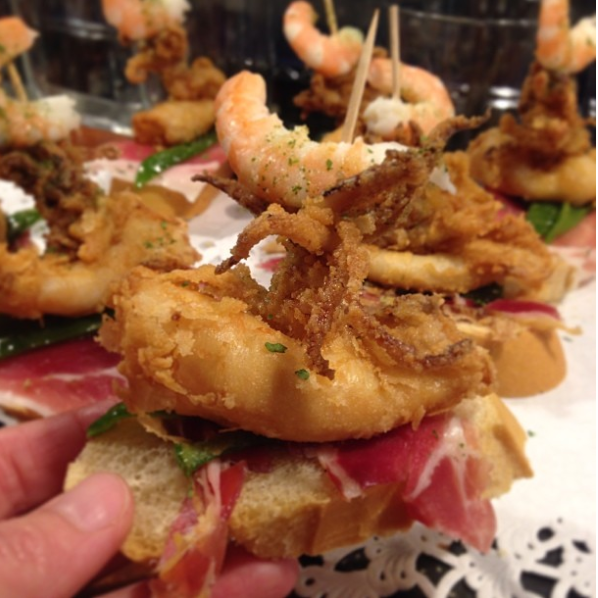 The most obvious difference is pintxos are mostly bread-based towers of varying height and composition, speared with a stick (pintxo) and resting on a slice of white baguette. Traditionally enjoyed standing at the bar or an outside counter, weather permitting. Patrons are expected to keep the pintxo sticks as a means of tallying their bill. Except when used raw or preserved, toppings are mostly fried. 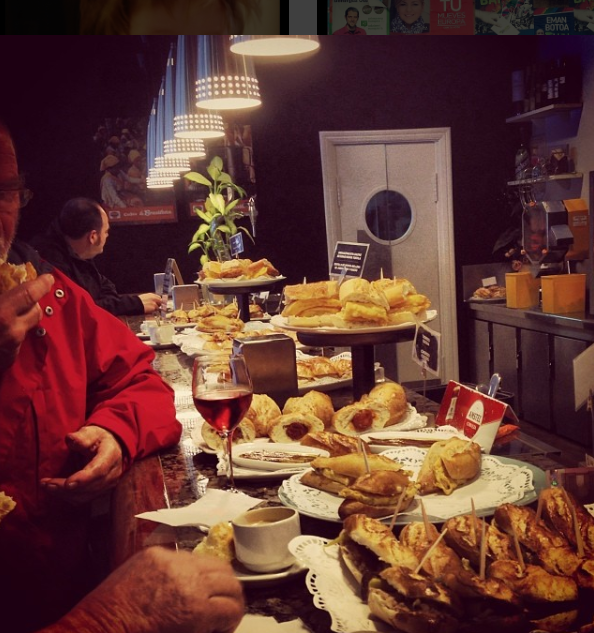 The bars generally have a staggering variety and if you don’t choose well, or are too greedy, a pintxo binge could leave you feeling liverish. These Basque beauties never gave me any grief. From left, clockwise, on bread: ham slivers, mayo and prawn; jamon, red pepper, manchego, tiny blob of caviar; leek, mayo and ham; a gilda (more about that next) and foie with a quince syrup, if I remember correctly. 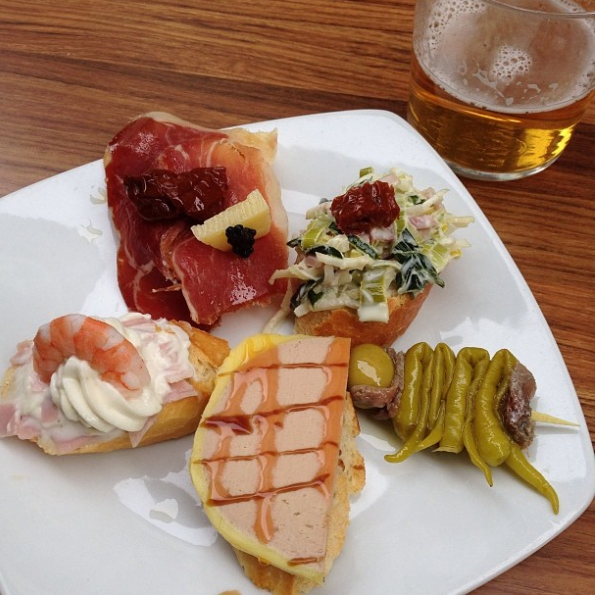 Gildas are apparently the first recorded pintxo and nothing but absolutely nothing pairs better with beer. 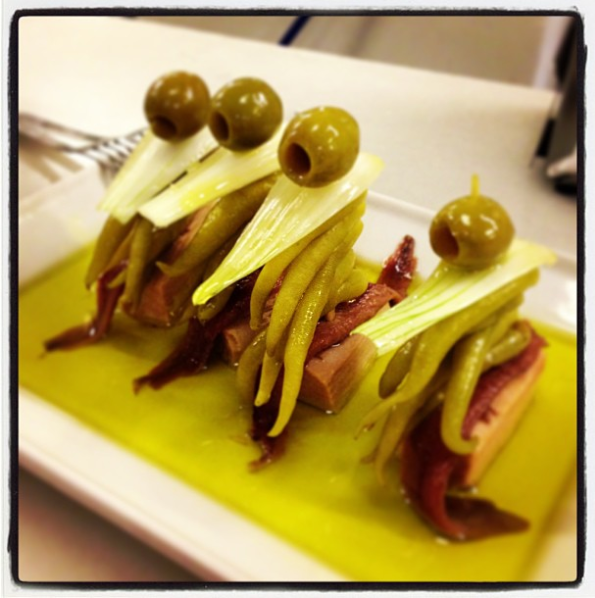 Premium Cantabrian anchovy fillets, guindilla peppers and pitted manzanilla olives on a stick. 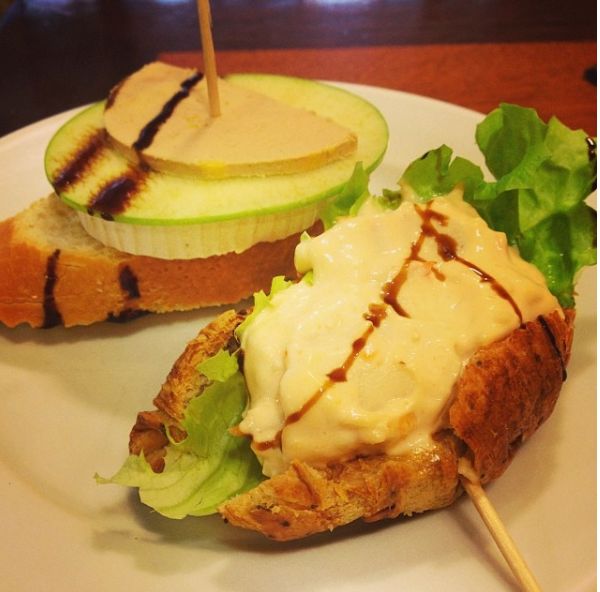 The best ever was at a jam-packed pintxo bar in San Sebastian. They anchored the gilda with a square of bonito, or Spanish tuna. And the pool of olive oil is so good, you’ll drink it. If there’s a stick in it, it’s a pintxo. Ham and cheese toastie, why not? Or the egg of a hake lady fish – delicacy of this area… This is the closest I got. But mostly I popped into my favourite tapas bar in Getaria for a coffee and this decadent combo, after walking my son to creche in freezing crosswinds and driving rain. The Basque country is on the receiving end of some serious weather. Burning off a few mouthfuls of deep fried tidbits is not a problem. Crumbed seafood, fried ham, cheese and anchovy get together on a stick in near endless combinations. 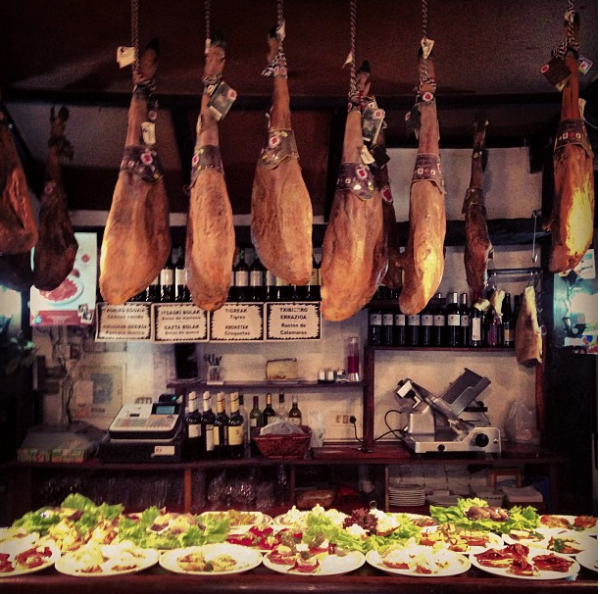 I’ve unfortunately lost most of the thousands of photos (of tapas) I took in Barcelona. What stood out at Tickets, especially, was the superb quality of the produce and the masterful restraint to not crowd a plate or hero ingredient, thereby allowing it to truly shine. Combining flavours of the sea and mountain is a recurring theme. Like this exquisite tapa from Tickets. 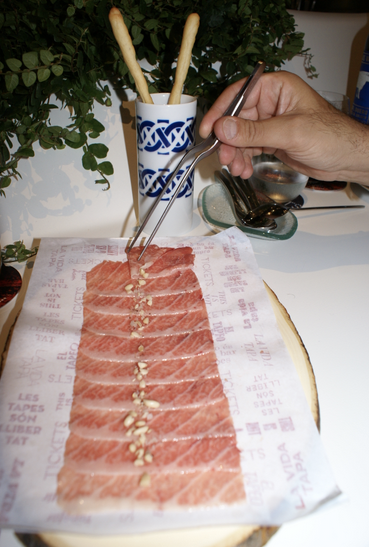 Paper thin slices of tuna belly, rubbed with jamón ibérico fat. YES. Fish massaged with pork fat. 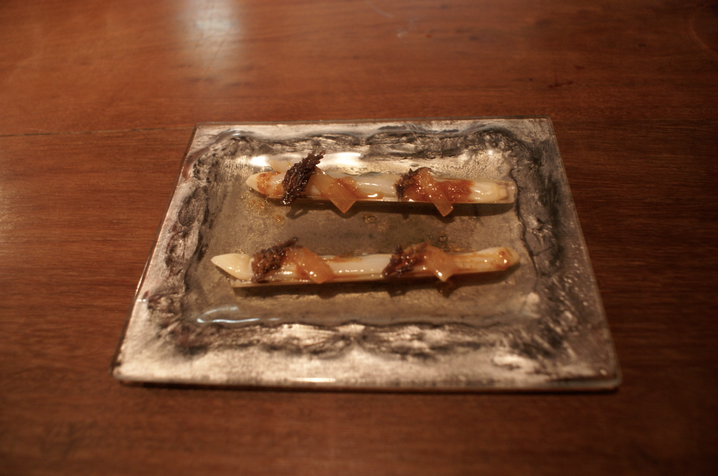 And these razor clams in ginger oil at Dos Palillos, a Japanese tapas bar in Barcelona by ex elBulli headchef, Albert Raurich. I know. So much of the great stuff depends on Spanish produce. And you either don’t get it outside Spain or the quality vs price ratio is not feasible. 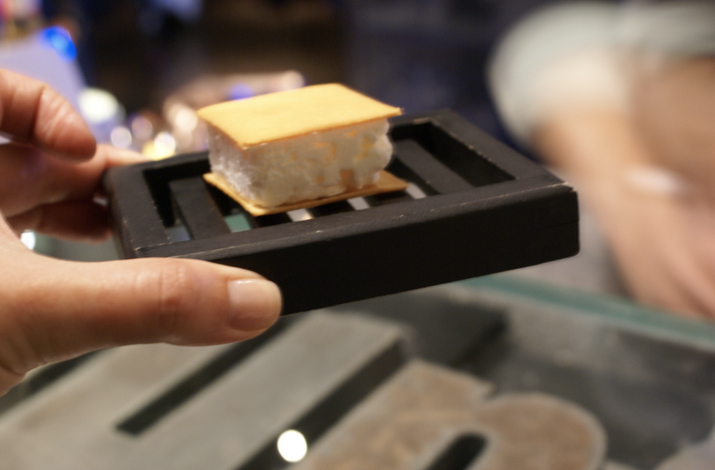 But there’s also this… originally served at elBulli, a Parmesan ice cream and marmalade S’more, for lack of a better description. From the tasting menu at 41 Degrees, Barcelona. 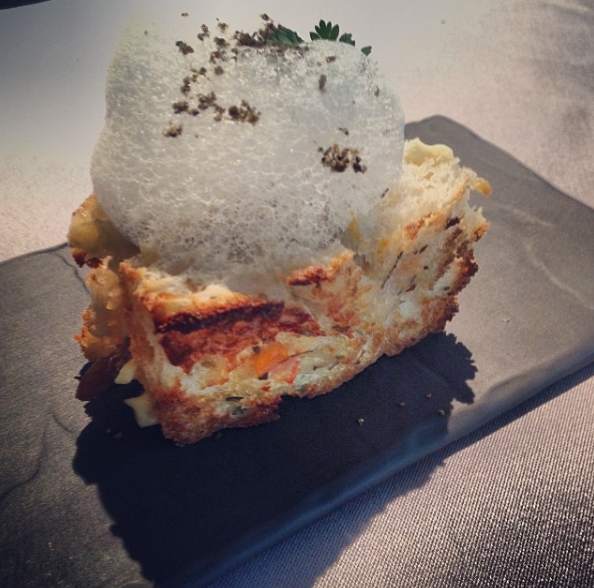 From Abaco restaurant in Pamplona, the winner of the Best Pintxo in the Basque Country, 2013. And the previous year’s winner, an inspired take on paella from a restaurant in Fuenterrabia between San Sebastian and France. This is but the tip of the tapas iceberg consumed during my 3 years in Spain. 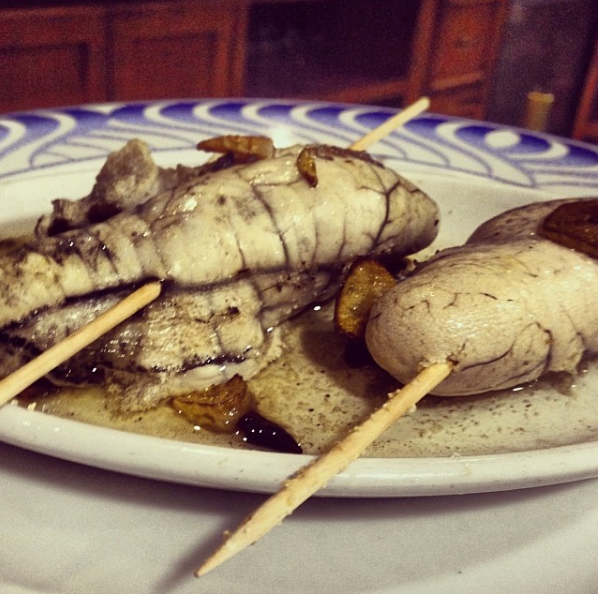 Clearly, tapas can be many, many different things. But not everything can be tapas. Tapas need not be Spanish, as the eating of a succession of small portions has been applied successfully to Japanese, Mexican and Indian cuisine, to mention a few. What, if any, is the difference between a tasting menu and a tapas menu? And is it wrong to call small portions of pub grub “tapas”? It’s a free world but don’t go to Spain expecting chilli poppers and chorizo fried with peppers and olives. Although I must say, for a non-Spanish “tapa” the latter is pretty tasty. Then again, as Jamie knows, everything tastes better with chorizo. Next up, how to drink tapas-style! Let’s talk about traditional and modern Spanish tapas and about developing authentic South African tapas that respect the principles inherent to Spanish tapas. For consultation, menu planning, recipe development and taste testing, contact bianca@kitchenvixen.co.za or leave a comment. You are currently reading What is tapas at Kitchen Vixen.